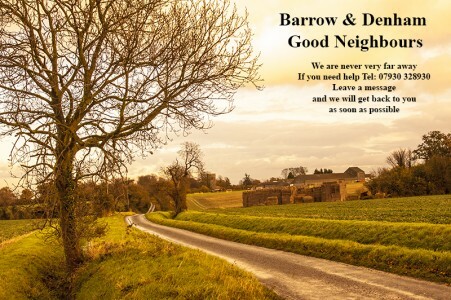 For the past seven years a number of local volunteers have run the Barrow & Denham Good Neighbours Scheme. The Parish Plan has recently brought it again to the attention of people in Barrow and Denham, and we are pleased that many new volunteers are happy to join our group – not just retired people, but also younger members of the community. So this is a good time to see where we are going in the future, and we are working towards a re-launch in 2014 with the intention of seeing if we are still the organisation that the people of Barrow and Denham really want. So What do you need to do? Pass this information on to people who you think could do with our support, and keep theHelpline Telephone Number 07 930 328 930 handy for when it is needed. T he Good Neighbours aim to provide small, occasional services that older and disabled folk might find difficult to carry out for themselves. Requests for help have been mostly for lifts to the West Suffolk Hospital, the surgery, the hairdresser and supermarkets. At other times we have been asked to sit with a sick relative, carry out minor DIY jobs and repairs and to help fill in forms. All these services are totally free, but when a lift is involved, then 40p per mile (present rate) is charged to cover the driver’s costs. Some new ideas have already been suggested, like looking after pets when their owners are in hospital, or just having a chat with lonely people. This would perhaps overlap with the work of the Church and we have talked to the Revd. Dr. Barbara Sherlock to get her views on the matter.